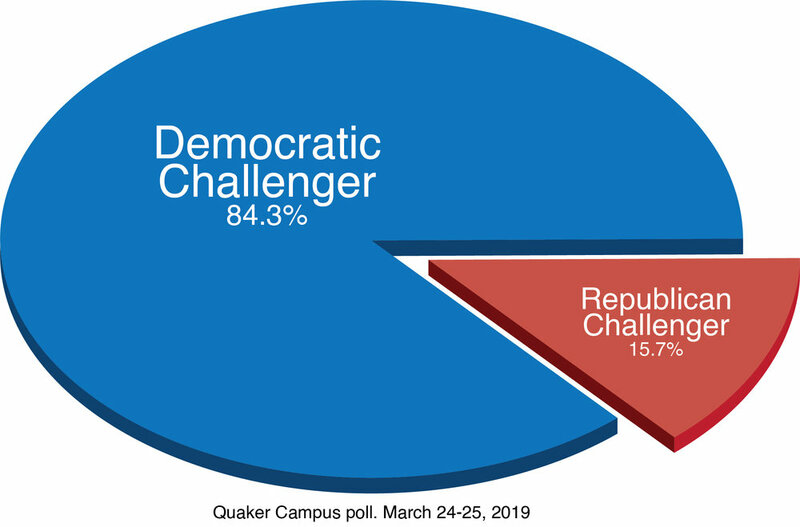 On Sunday, March 24, the Quaker Campus (QC) conducted public opinion surveys via our official Twitter, Instagram, and Facebook to ask what candidates and policies voters are considering going into the upcoming presidential campaign. This survey was conducted after the Mueller report concluded, announcing that there was no evidence of collusion with Russia. The 2020 election is already gaining a lot of attention, as over 20 candidates from the Democratic party alone are likely entering the race, according to The Atlantic. 84.3 percent of QC respondents answered that they would back the Democratic nominee over Trump, whereas 15.7 percent responded that they would back Republican candidates. Our sample size across all three social media platform was 102 respondents. Such results are perhaps not surprising for voters from California’s 38th Congressional District, which has a Cook Partisan Voting Index of D+17 — meaning voters largely favor Democrat candidates compared to the nation overall (as of 2018). Furthermore, the Whittier College student body is incredibly diverse. According to Whittier.edu, more than half of students identify as people of color, almost 70 percent are below the age of 21, and almost 60 percent of students are female — all of which are populations more likely to support a Democratic candidate than a Republican candidate. Popular candidates among the Democrats from our poll included Sen. Kamala Harris, Sen. Bernie Sanders, former U.S. representative Beto O’Rourke, Sen. Cory Booker, and former Vice President Joe Biden, who has not officially thrown his hat into the ring. There was no clear majority for any particular candidate. This can likely be attributed to the fact that we are in an early stage in the election cycle, and a crowded field has made it difficult for Democratic voters to rally around a specific candidate — which is a fact also reflected on a national scale. Nationally, Democrats favor Biden (29.6 percent) and Sen. Sanders (23.8 percent), who, at most, only have the support of one-fourth of the Democratic party, followed by Sen. Harris (10 percent) then O’Rourke (8.8 percent), according to average statistics of CNN, Fox News, Morning Consult, Monmouth, and Emerson. Given that primaries start Feb. 2020, which is typically when certain candidates start to pull away from the pack, Democrats still have time to rally behind a forerunner — though it is unclear whether it will be Biden, if he enters the race, or Sen. Sanders. Additionally, the first Federal Elections Committee fundraising deadline is coming up soon, which will give a sense of where campaigns are at money-wise. The goals of President Trump’s reelection campaign are unclear, as the only official news of his campaign is that it will run with the Republican National Committee (RNC), and the president’s campaign as a single entity to make “the biggest, most efficient and unified campaign operation in American history,” according to RNC Chairwoman Ronna McDaniel. Sen. Harris, meanwhile, is running on a platform of criminal justice reform, amending bail for suspects, and allotting monthly cash payments of up to $500 for lower-income families. Sen. Sanders’ campaign promotes universal healthcare, income equality, and the institution of free public college, the latter which has made the older candidate popular amongst young voters. O’Rourke is running on a platform primarily focused on revoking President Trump’s immigration policies. He has gained much social favor especially from young voters for his youthful charisma and refusal to take money from the Political Action Committee — which represents business, labor or ideological interests — during his race against Senator of Texas against Ted Cruz, which O’Rourke lost. Sen. Booker’s Democratic campaign focuses on similar issues of criminal-justice reform, including marijuana liberalization and Medicare-for-All. Lastly, former Vice President Biden has gained popularity due to his more moderate stance on issues. The issues Republican voters remain most concerned with, according to QC polls, include “taxation” and “economic policies,” presumably supporting less taxation of the wealthy and policies opposed to government-regulated welfare, as well as taking a firmer stance against socialism. Democratic voters are more concerned with issues of LGBTQIA+ rights, safe contraception and abortion availability, and healthcare, immigration, gun control, public school education, and environmental policy reform. Such policies, especially immigration, healthcare, and gun control, are likely to take the front stage in the 2020 election. As for now, the major issue of border security polls with the “majority of Americans (58 percent oppose substantially expanding the wall along the U.S.-Mexico border – as Trump has sought – while 40 percent support doing so, according to a January 2019 survey by the Center. Attitudes diverge sharply by party: Around eight-in-ten Republicans and Republican-leaning independents (82 percent support expanding the wall) while an even larger share of Democrats and Democratic leaners (93 percent) oppose it,” according to pewresearch.org. Additionally, kff.org reports that 56 percent of voters support Medicare-for-All, as of Jan. 2019. As for gun control, about “three-quarters of Republicans (76 percent say it’s more important to protect the right of Americans to own guns than it is to control gun ownership, while just 19 percent of Democrats agree. That 57-percentage-point partisan gap is up from a 29-point gap in 2008,” according to pewresearch.org. The best way to ensure your favored policies are enacted is to stay informed. The Quaker Campus will continue to report on this story as it develops.